Boutique hotels in Tel Aviv offer visitors a specialized experience, making them an increasingly popular choice among visitors to the city. They are usually located in the middle of the city, smaller in size than standard hotels and give people more of a feel for the real character and history of Israel’s cultural capital. Tel Aviv’s boutique hotels boast distinctive interior design and hospitality with a personalized touch and are often equally central but at the same time less expensive than other hotel options. These are just a few of the best boutique hotels Tel Aviv has to offer. Located in a Bauhaus building in Tel Aviv’s bustling city center, the ever-evolving Diaghilev Hotel is a unique boutique hotel that features new artistic creations on an on-going basis. The hotel also hosts art exhibitions and other cultural events on premises. Just meters away from the hotel lies Rothschild Boulevard, lined with local bars, cafes, restaurants and other attractions. Diaghilev is also within walking distance to the Neve Tzedek neighborhood and the beach. It is a favorite among business travelers, who enjoy the change of pace and special perks, including an on-site hub for young startup companies, where they can interact with local entrepreneurs during their visit. The lavish Hotel Montefiore is the original Tel Aviv boutique hotel. What it lacks in size — just 12 rooms — it more than makes up for with elegance, charm and character thanks to individually designed, luxurious rooms, a French-Vietnamese fusion brasserie restaurant and a central location just minutes from popular districts like Rothschild Bouelevard and Shuk HaCarmel. With its unique character, personalized service and first-rate facilities, Hotel Montefiore is an establishment that truly captures the essence of what a boutique hotel should be. This exquisite Rothschild Hotel is one of the newer entries to Tel Aviv’s boutique scene. Located in one of Tel Aviv’s most trendy neighborhoods, the historic building is also the former home of Abraham Friedman, the chief agricultural adviser to Tel Aviv’s unofficial founding family, the Rothschilds. The Rothschilds were a wealthy European family who funded the immigration to Israel of many Jewish families. Each of the hotel’s 6 single rooms, 16 double rooms and 7 suites is decorated with with photos of the Rothschild enterprise of the 19th and early 20th century. The hotel is ecologically conscious from top to bottom, with the infrastructure and interior design of the hotel primarily constructed of natural materials, such as stone, wood, iron, brass, clay and leather. The hotel specializes in seafood and the hotel shows its sense of social responsibility by purchasing its toiletries from Es-Sense, a small factory on a farm in the picturesque hills of Jerusalem that employs workers with autism. The staff are renowned for being very personable and caring and the rooms are deluxe suites, with two bathrooms, two TV’s, a sitting room and a king sized bed. The hotel is small and comfortable and provides an excellent service to guests. People who have stayed there talk about how clean and well kept the rooms are and how tasty the breakfasts are. The hotel has received excellent reviews by businessmen and holiday makers alike. The hotel is close to restaurants, shops and entertainment. While the hotel is relatively close to the beach, it is a walk, so be prepared. Also, with regard to parking, it is available but would be harder for medium sized cars and virtually impossible for big cars. Located in the upscale, historic Neve Tzedek neighborhood, Brown Urban Hotel is one of the city’s up and coming boutique hotels. Each of Brown Urban Hotel’s 30 modern hotel rooms has a comfortable bed, black marble hydro-massage shower and a plasma TV equipped with an internet protocol television system. Superior and deluxe rooms are larger and come with additional amenities ranging from bathrobes to a double spa bath. The hotel also features a sundeck with a bar and cabanas, spa, and lounge bar. Guests also have free access to a local gym and get a complimentary breakfast at their choice of three nearby restaurants. Brown has also become known for its laid back Friday night rooftop parties in the summer, which attract a notably trendy and stylish crowd, as well as a favorite place of accommodation for gay travelers. This renovated beach house turned boutique hotel manages to simultaneously be in one of the busiest, most central beach locations in the city while also serving as a place escape the hectic life of the city. Shalom Hotel & Relax by Atlas Boutique Hotels was built and designed to resemble a Connecticut beach house that upscale New Yorkers flee to in the summer months, including a beautiful sunroof terrace with a stunning view of the beach. The rooms come equipped with all the standard amenities and upgraded rooms have additional features, such as a hot tub with a sea view. In addition to its proximity to popular districts like Dizengoff Street and the Tel Aviv Port, the hotel also offers in-house entertainment, such as evening happy hour on the rooftop terrace with refreshments and free 15-minute massages, and free bike rentals. The Leonardo combines urban adventure and breathtaking design and luxurious facilities. It boasts a desirable location in Tel Aviv’s Ramat Hahayal neighborhood, the heart of the city’s high-tech industry, as well as an inspired design intended to integrate modern and Renaissance styles. 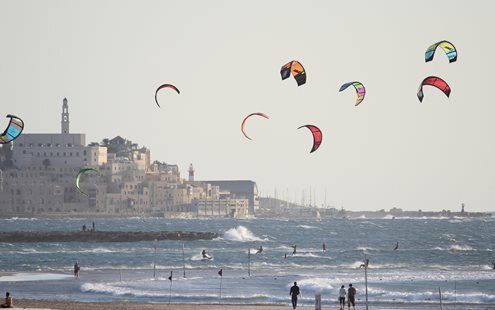 The sophisticated and cosmopolitan ambiance, reflects that of Tel Aviv itself, as past guests often talk about the mysterious, magical and bohemian atmosphere there. There is also a gym on the 9th floor which you can relax and reinvigorate yourself in. While the Leonardo Boutique Hotel is a bit outside of the normal tourist stomping grounds, it is close to a number of popular and upscale restaurants and shopping areas. Its location also offers easy access by car to the Tel Aviv Convention Center, Tel Aviv University and the main highways into central Tel Aviv and northern suburbs, making the hotel ideal for both business and leisure travelers alike. Business travelers and companies will benefit from the professional business lounge, three conference rooms and stylish bar on the ninth floor, as well as a fitness center. It has 167 rooms of various sizes and has superior facilities. Each room offers LCD TV, DVD player upon request and down comforters and pillows. The hotel also provides accessibility for the disabled. We think that these are some of the best boutique hotels at the moment, but there are certainly many more and new hotels are popping up almost constantly. If you didn’t see what you’re looking for in this article check out more possibilities in our complete hotel index.